Skylights are a great addition to any house, as they bring in more natural light – cutting down on artificial light electricity costs, as well as promoting good health for a home’s occupants. Unfortunately, however, skylights are hard to install in most pre-built homes because they require so much roof real estate. Also, unless the sun is at the right angle and there are absolutely no clouds in the sky, skylights don’t always illuminate a space in a way that makes their cost worthwhile. Thats why we love Solatube – a smart technology which takes skylights one step further by refracting, reflecting and concentrating solar light into a small tube using mirrors and lenses. Solatube’s efficiency comes from its patented Raybender Technology and Light Intercepting Transfer Device (LITD). These two items allow Solatube to utilize light that is not necessarily in the direct path of the tube and redirect it to provide optimal light from sunrise to sunset. Available in three models, a compact 10″, a larger 14″, and an even larger 21″ Solatube demonstrates how even a small opening can bring a lot of illumination into a room, using forward-thinking technology. I love it, thanks for great article. Another option to Solatube is the SUN GLO Tubular skylight. A new patent pending low profile flashing. Check it out at http://www.sunglo.biz Unlike Solatube which is mostly plastic and only has a 10 year warranty, SUN GLO has a metal flashing and a 50 year warranty. you have made some interesting points in this article you really know alot on this topic. Thanks for posting it.We are interested in you tubular sky lights for our show office for the current project in hand. Solatubes are pretty expensive to buy all the way from the UK for ordinary people living in poor economies. In Sri Lanka we could manufacture it for less than 5 times the UK amount. That is what we will have to do! Dr. Thomas H.J. Pieters, Inventor/Owner Smart Fiber Skylight Parent Company, Sri Lanka. I installed 3 solar tubes in new construction and left the film on for protection. Now it is baked on and i can't get it off. Any suggestions? a natural brightness to be directed to your convenience , an good green concept. Any suggestions on how I can fit a blind over the skylight at night - I am trying to limit the sunlight waking my kids up at 5am! I tore out your Solar Tube advertisement from the, I think it was called, Adventure Life magazine while waiting in my doctors office and it might be what my daughter wants for one of her bedrooms in their home. I'm going to give her your web-site and we'll see what she and her husband think of it. I think it's a great system, we'll see what developes. Thanks. Like the Solatube, but don't like the "hotspot" on the ceiling. Has anyone seen one installed in a recessed area, essentially creating a skylight box effect? If so, does it work aesthetically, in your opinion? The goal would be the effect of a skylight without less risk of leaking and hail damage. I live in a town house. Can my home owners association board restrict me from puttinng them in? That's a good way to conserve electricity. If I where to build my own solar tube, what are the materials need to build one? Looking for a solar tube light that can be mounted to a 12-12 pitch steel roof. 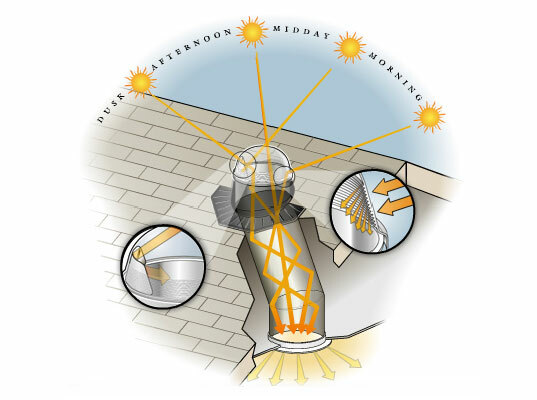 I wanted to inform you that the term "solar tube" is not recognized by the National Fenestration Rating Council which rates and measures skylights. To ensure the accuracy of this article and future articles, I wanted to provide you with the appropriate industry accepted terms. 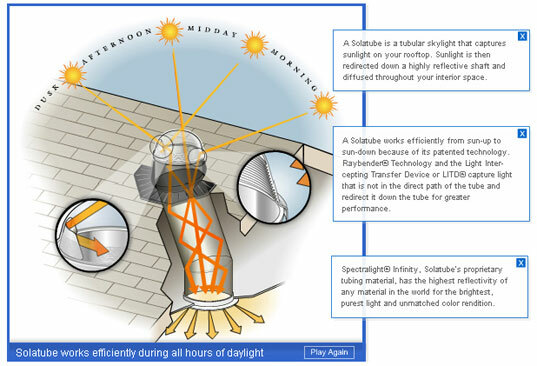 We suggest any of the following as a substitute for the term "solar tube:" • Solatube Daylighting System (if you wanted to refer to the Solatube brand name) • Tubular Daylighting Device (if you wanted to refer to the specific category) • Tubular Skylight (if you wanted to refer to the generic category) Often times, consumers get confused between our brand, Solatube, with the term "solar tube" and we are working to clarify any misrepresentation. With that being said, I was wondering if you would be willing to make those small necessary changes to your article. Many thanks for your consideration of this request. Due to some leaking issues we resently removed the skylights in our kitchen. I was hoping to get them replaced but my husband and our contractor talked me into getting a solar tube. I'd never seen one in person but it sounded like a good idea. It's natural light from the sun. How can that be a bad thing? They just got installed yesterday and when I came home from work to see the finished product, I have to say I HATE it. I miss the natural light I got from my sky lights. The solar tubes produce such an obnoxious bright white light that it's overpowering. I feel like I'm on stage, with someone shining a spotlight on me. I would only recommend them to someone who has vaulted or cathedral ceilings. Our 8ft ceiling and small kitchen is over powered. After investing the money, I now feel like I'm stuck with them. My advice would be not to purchase a solar tube until you see them installed elsewhere first so you can see the brightness for youself . I also wouldn't recommend installing them unless you have high, raised ceilings. I was reading many of your comments on here, and as a personal worker at a Tubular Skylight Manufacturer and personal solar retailer I though I could clear up a few things. Tubular Skylights don't require any light bulbs what so ever. The light you see produced is coming from the sun. The Highly reflective tube is whats directing the light through your diffuser into your home. I have created some educational content and even have a few videos of tubular skylights that you can visit at my Tubular Skylights link. Hope I can clear some things up. I want to know how to take off the cover of my solar tubr without breaking it ,to replace the bulb. I want some skylight prices. this design is very good. can i request for the details of this design. thank you. Can these be installed through a Spanish tile roof? Do Solatubes transmit UV rays ,for winter greenhouse/gardening applications? Does it block uva/uvb rays or would I have to wear sunscreen/block in the house? Hello, John Izzo here, President of Sola-Brite of Pleasanton, Calfifornia. We are a "Premier" Dealership for Solatube International in the Bay Area, specifically serving the East Bay Counties of Alameda and Contrac Costa as well as San Joaquin and San Francisco counties. We have a full service showroom located in Pleasanton. Please visit and see what a difference a Solatube can make in your home! We know that you will be impressed! The showroom has all sizes of Solatube installed, with/without accessories and have the new Designer Touches available for your viewing as well. Either myself, Cindy or Bill would be happy to provide you with a demonstration and answer all of your questions. We are open Monday thru Friday 9:00 am to 5:00 pm and on Saturday 9:00 am to 4:00 pm. Sola-Brite provides installation in the counties mentioned above. All of our installers are Certified Installation Consulants and expertly trained in Solatube installations. Contractor? or just like doing it yourself? We sell do-it-youself kits at our showroom in Pleasanton. We also ship and deliver products. Call 925-600-1400 or email us at [email protected] for pricing. Up to 1 year same as cash financing available!! Free Consultations availalbe. Visit Sola-Brite at www.solabrite.com or email [email protected] for additional information The Sola-Brite Team "We Brighten Your World"
Do you know of any cons? I would like to know of any before I think about putting them in my house. Do you know if they can be put in a basement or floor if there is a floor above? Please reply quickly--I need the information by Thursday the 10th. Thank you. Hi, I amTom Romak the owner of of Renaissance Builders a licensed building contractor and a Solatube Dealer in the San Franisco Bay area. I offer a full range of the Solatube skylights and the Solar Star Attic Fan. (an attic fan powered by the sun which removes both heat and moisture from your home's attic area). If anyone in the Bay area has any questions regarding Solatube products and what they can do either for your home or business in the way of energy savings, contact me either by phone 408-720-1100 or toll free 1-888-888-098 and by e-mail [email protected] Solatube skylights quailify for energy tax credit per the Energy Bill 2006 passed by Congress. Contact me with your questions, I can help. Sola-Lite Incorporated is the Premier Solatube Dealer for San Antonio and South Texas. If you live in this area and have any inquiries, please contact one of our Daylighting Experts at www.solalitetx.com/210-764-7652. As mentioned above, if you live elsewhere you may also visit Solatube International's website (www.solatube.com) and you will be able to locate a dealer worldwide. A question was raised by Pete on Sept 9. Yes, there is a HUGE difference between Solatube and Sun Tunnel. First, a Solatube has patented technology in the dome that gives it twice as much Effective Daylight Capture Surface than a Sun Tunnel. This technology is called Raybender 3000 and the Light Tracker, which redirects ambient and southern light into the Solatube. This is extremely beneficial during cloudy and winter days. Sun Tunnels do not have this technology. Next, Solatubes use a heavy guage, seamless all-metal flashing to attach the Solatube to the roof, which also allows us to be placed on metal roofs as well. The most dramatic difference is in the tube lining. Solatube is lined with Spetralight Infinity, which is recognized as the most reflective material on earth. Sun Tunnels use a considerably less reflective material that actually alters the color of the light as it comes into your home. Because of the amount of light entering the tube, and its reflectivity, Solatubes can be run 20 to 30 feet with minimal light loss. As mentioned previously, running Solatubes through second floors is not commonplace, but Solatube's ability to transfer light these distances, is why we are able to bring light downstairs. Next, Solatube offers an assortment of diffuser (ceiling lens) options to meet your needs. If you have a Premier Solatube Dealer in your area, you also get a few more perks. Premier Dealers, such as Sola-Lite Inc. in San Antonio, are bold enough to light their entire showrooms with nothing but pure, natural light from Solatubes during business hours. You don't have to believe a thing we say, just come and see for yourself! Next Premier Dealers offer Certified Installation from technicians that must meet stringent requirements from Solatube International. I hope this helps. Solatube is an amazing natural daylighitng system that is easy to install, affordable and brings natural light into any room in your home or work space. If you are looking for a Solatube dealer in your area please visit www.solatube.com, you can enter your zip code and the nearest dealer to you will appear. Have a Bright Day! We had a solar tube installed in our Living Room – it was rather dark what an amazing difference it makes the lighting is natural and it doesn’t give the appearance of a spot light. I only wish I had enough nerve to do it three years ago when it was first suggested. Tickets to go the Home Show to visit the Solar Tube display $18.00 Parking while at the Home Show $10.00 One 14” Solar Tube installed $545.00 The Improvement in Lighting in our Living Room – Priceless Thanks Solar Tube for developing a solid product at an affordable price. Just wondering if there is a difference between a solar tube and a sun tunnel? I'm working in a bakery and we have two sets of offices in Kingston, Jamaica. I'd like pricing on your light. need a price for 2 tubeskylights for bathrooms in honolulu, hawaii. thank you. Can Solar tubes be used to get light to various locations on the first floor in a 2nd story home? How do turn down the brightness, if the tube makes the room too bright? "make the light look more natural"? solar tubes use the most natural light available! In fact, most people are pretty surprised when they learn that natural sun light is way whiter than all fluroecents and HID sources- the nice warm glow of incandescents is possible because of the wasteful, burning filament. If this coloring is more appealing, I suggest getting a colored lense for your solar tube, works like a charm. I am looking for a solar tube with a built in fan, do you carry this? I am looking for a solar tube with a fan for the bathroom. Yeah, I am concerned about the unnatural whiteness of the light, too. I hate the blueness of Low-E glass and I am looking for something to warm up our rooms. Just had 2 installed. Light is a lot "whiter" than I would like. What other diffusers are available to make the light look more natural? Changing a light bulb in a Solatube is a snap. The diffuser, or fixture, is easily removed by pulling down on it. The light bulb can then be changed out. On older Solatube models, one has to line up 4 "zip-ties" and push upwards to replace the diffuser. On Solatube's newest models, the 160 Daylighting System and the 290 Daylighting System, the Diffusers just pull off, and just as easily push back on. The light kits put out amazing light at night. Solatube also has a couple other features such as the Daylight Dimmer, and the bathroom ventilation kit. Is it a pain to change the light bulb? I have one of these in my home, and I'm surprised that your article doesn't mention the option to have a light fixture within the Solatube. My otherwise very bright home has a short hallway that was rather dark, so I installed a Solatube containing a light fixture. So during the day, I get great natural light, and at night, I use the electric light contained within the Solatube (on a dimmer of course)! It's fantastic. Skylights are a great addition to any house, as they bring in more natural light - cutting down on artificial light electricity costs, as well as promoting good health for a home's occupants. Unfortunately, however, skylights are hard to install in most pre-built homes because they require so much roof real estate. Also, unless the sun is at the right angle and there are absolutely no clouds in the sky, skylights don't always illuminate a space in a way that makes their cost worthwhile. Thats why we love Solatube - a smart technology which takes skylights one step further by refracting, reflecting and concentrating solar light into a small tube using mirrors and lenses.